Among our most tender and succulent meats. 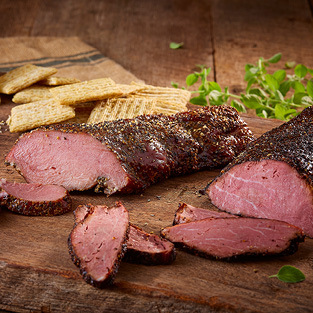 We hand-cure, pepper and smoke our Tenderloins over mesquite embers until fully cooked. Choose from Beef or Pork Tenderloins or try our combo-pack to sample both. Our combo-pack contains 1 lb each of Beef and Pork Tenderloin. We’ve added several new larger selections, so you can stock up at a savings.